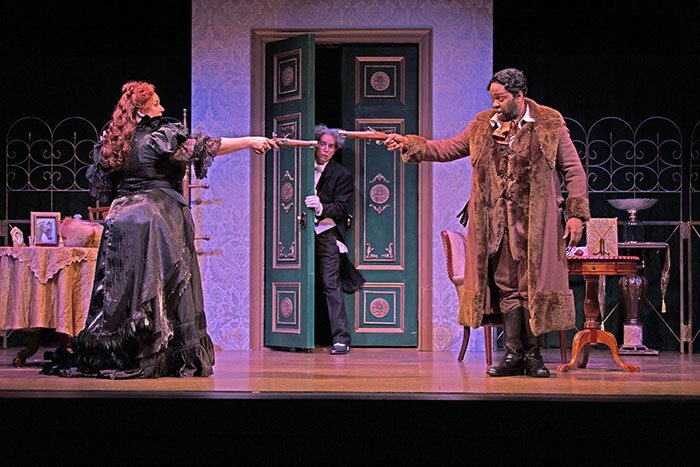 Two comedies, one light and frivolous, the other seriously funny, delighted the audience at the BU Theatre on Friday night in continuation of Odyssey Opera’s “British invasion.” The more significant of the two is William Walton’s The Bear, based on a farce by Chekhov. It is almost incomprehensible that this brilliant one-act opera is so little known. When the work was first performed, in Aldeburgh on June 3, 1967, most of the critics gave it a reasonably warm welcome—something of a surprise, since Walton had been receiving what he called “drubbings” from the press for a number of years. One critic-scholar even maintained, for a BBC documentary, that nothing Walton had written since World War II was particularly significant. (Needless to say, this outraged the composer who refused to let the documentary be aired in that form, and the BBC made suitable adjustments.) But The Bear opened successfully. Andrew Porter in the Musical Times, described it accurately as “One of the strongest and most brilliant things Walton has written.” If the first performance had been anything like the one that I saw at the BU Theater on Friday, every critic would have hailed it as a masterpiece of comic opera. The biggest problem with mounting The Bear is finding a suitable companion piece to go with it. Just as “Cav and Pag” have become a standard set in the opera world, an appropriate pairing for The Bear would help it achieve many more performances than it seems to have done because one act of about 45 minutes by itself is an awkward length for live performance. 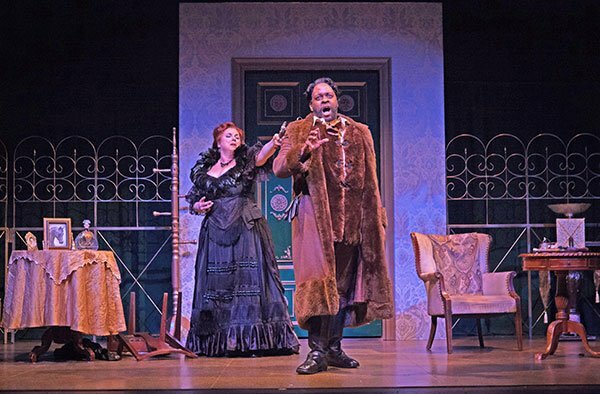 Odyssey Opera’s ongoing Festival “The British Invasion,” offered an unlikely but charming companion piece: a virtually unknown comic opera by Arthur Sullivan, a work from early in his career, fairly recently discovered and published. I would not suggest that The Zoo should always be mounted as a companion piece for The Bear, but on this occasion it provided a delicious introduction, full of light-hearted frivolity, to what might be called the more serious farce of The Bear. In The Zoo Arthur Sullivan was working without his famous collaborator W. S. Gilbert. He had by this time created two works with Gilbert, Thespis, or Gods Grown Old, written as a Christmas pantomime in 1871, and the brilliant one-act curtain raiser Trial by Jury, which Gilbert and Sullivan wrote in the opening months of 1875 and produced in March just three months before The Zoo. Trial by Jury was the team’s first big success, running some 300 performances, but it wasn’t until two years later that Gilbert and Sullivan became established permanently as a team. The Zoo is in many respects cut from the same cloth, though the lyrics and plot are distinctly less brilliant. But after all, it was the revolution wrought by Gilbert and Sullivan in the following decade that really raised the standard of Victorian theater. Stephenson’s work was regarded as amusing and delightful in1875, and that was what he aimed at. Sullivan’s music adds its own considerable measure of charm to the result. The simple plot takes place at the London Zoological Gardens. The chorus (“the British Public”) has come to view the animals. They are interrupted by a young man, Aesculapius Carboy, who is determined to hang himself for unrequited love. He explains that his sweetheart, Laetitia Grinder, has been forbidden by her grocer father to marry a mere apothecary. This attempted suicide is interrupted by Eliza Smith, described as “a perfectly virtuous and highly principled young lady in charge of the refreshment stall.” She begins selling her fruits and sweets. Thomas Brown enters and fears for a moment that Carboy is a rival for Eliza’s affections. She quickly disabuses him of this notion, and they sing a love duet. Laetitia arrives, happy to discover that Carboy is still alive, and they begin their own love duet; meanwhile Eliza is busy feeding Thomas some of the sweets that she sells in her stall. This becomes a patter song as they both categorize the items that he is eating and drinking, while Laetitia and Carboy sing their love duet in counterpoint. Thomas cries out for help (bringing the chorus in), because he has eaten so many sweets that he now suffers a massive stomach ache; he passes out. As they attempt to help him, they realize that he is not simple Thomas Brown, but is in disguise. In fact he is the Duke of Islington, who has gone incognito in search of virtue, which he has found in Eliza. This production of The Zoo has been designed to enliven the simple story with bright colors and animated movement. When the curtain rises, the audience is treated to a delicious Technicolor display. Though the chorus describes itself as representing the British Public, director Lynn Torgove had the brilliant idea of creating impressions of the animals that otherwise are not visible. Each member of the chorus is costumed in such a way as to represent an animal in the zoo. Costume designer Amanda Mujica has accomplished brilliant things here, creating clothing that makes the members of the chorus appear to be monkeys, lions, giraffes, a zebra, a Bactrian camel, several kinds of birds including a toucan, and more. Moreover, each of the singers moves about the stage with gestures that suggest the motions of the animal that they are dressed like. This lovely touch provided a special visual richness to the stage picture, and the “animalistic” antics included some delightful visual humor. Even given that the libretto by B.C. Stephenson, using the pen name Bolton Rowe, does not live up to the satirical or verbal brilliance of W.S. Gilbert, The Zoo is nonetheless clearly from the pen of Arthur Sullivan. The characteristic lighthearted tunefulness, the orchestration based largely on the model of Mozart (which Sullivan considered ideal for musical theater), and particular kinds of songs, all demonstrate this fact. Most characteristic, perhaps, is the contrapuntal double duet of the two pairs of lovers, a type that was to become absolutely standard in the later Gilbert and Sullivan operettas. In points like this contesting. Having created the song, Gilbert and Sullivan evidently decided that it did not forward the action sufficiently and that it slowed the unfolding plot. They cut it from the show. But Sullivan evidently liked it enough to give the melody to Stephenson suggesting that he use it in The Zoo. Stephenson was a reasonably successful writer of work for the musical theater (he composed Dorothy with Alfred Cellier, which in 1886, actually ran longer than The Mikado), but in this case he clearly fails to match up with Gilbert. The first of several verses that he writes to this melody uses the trivial word “and” as a rhyme word, something Gilbert would never have done. Her father had been a grocer. The later stanzas work better however and we must naturally recognize that Gilbert had the advantage that he was writing the words before Sullivan wrote the music press Stephenson had to find some way to fit new words to music that already existed. Two scenes in The Zoo—Carboy’s attempt to hang himself, and the chorus’s attempt to revive Thomas Brown after he had been overcome by an indulgence of sweets—were apparently invented to mimic elements of the plot of Offenbach’s La Perichole, which was running not far away—with Trial by Jury as its curtain-raiser! Lynn Torgove has directed both these scenes, especially the latter, in highly amusing ways that generated much laughter. The chorus, in all its costumed brilliance, moved and reacted with energy and vivacity to the goings-on. The soloists were both vocally very fine and also suitably caught up in the faux-melodrama of the story. The ladies—Chelsea Beatty as Laetitia and Sadie Gregg as Eliza—and their sweethearts—Daniel Shirley as Carboy and Colin Levin as Thomas Brown—made the most of every possible situation. Simon Dyer, as Mr. Grinder, had much less to do, but he made it up with a plummy role in The Bear. The stage design (by Stephen Dobay) is a simplified reflection of a large painting of the London Zoo. James Blachly conducted the orchestra and paced the work with aplomb. 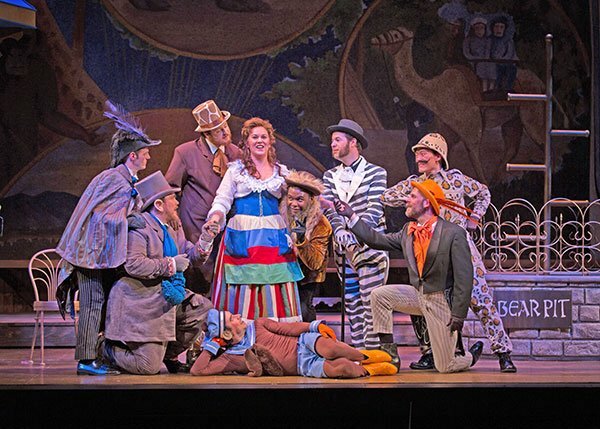 It is unlikely that The Zoo will find anything like the number of performances that Sullivan’s works with Gilbert receive regularly, but in this imaginative, colorful, and musically satisfying production it made a great companion piece for The Bear. The pièce de resistance of the evening was an utterly brilliant performance of Walton’s wonderful comic opera The Bear. Walton’s only previous operatic work was a large three-act opera, Troilus and Cressida, based on Chaucer rather than Shakespeare. He began composing the former in 1948, after Britten’s success with Peter Grimes showed that an English composer could succeed with an opera on a grand scale. It was produced at Covent Garden in 1954. Two later rounds of revisions and cuts (1963 and 1972-6) and rewriting the role of Cressida from soprano to mezzo have still not given it much resonance in the operatic world. But the original singer in the role of Pandarus, Peter Pears, urged Walton to write another opera. He resisted for some time, but eventually he found in Paul Dehn an excellent collaborator for a work in the comic spirit in which he excelled. The two men adapted Chekhov’s vaudeville The Bear into a compact, brilliant “extravaganza in one act” with the same name. (Walton’s biographer Michael Kennedy expresses regret at the fact that Dehn died soon after the completion of The Bear, so that the pair had no opportunity to continue in this happy vein). Walton had shown an ability to write witty and parodistic music from the very beginning of his career, though this marked him in the eyes of some overly-sober English critics as unworthy of serious consideration as an artist. But in The Bear he recaptured the spirit, if not the style, of his early style. He had a great fondness for the brilliance and lightness of Rossini, and though there is no hint of Italian bel canto style here, the work flows with the wit of that composer. Chekhov’s story is a simple one. A young widow, Madame Popova, continues to wear mourning black and to refuse all social engagements, or even a ride outdoors around her estate since the death of her husband almost a year earlier. Her manservant Luka begs her to consider a return to life, particularly since her husband had been neither kind nor faithful to her, but she insists that she will mourn until the day she dies. Her lonely life is interrupted by the arrival of a gruff, somewhat crude man, Smirnov, the “bear” of the title, who tells her that her late husband owed him a large debt which must now be paid off, or he will be forced to declare bankruptcy. She is angered by his vulgar manners, and leaves him alone, whereupon he laments that his creditors throng around him, but his debtors seem to disappear. When Popova returns they get into an argument as to whether men or women are more faithful. She describes her marriage in arguing that women are clearly more constant than men. He finally challenges her to a duel (by way of proving equality of the sexes!). She accepts, and gets her husband’s dueling pistols—but first he must teach her how they work. He gives her a rather flirtatious lesson, but when they are almost ready, he announces that he will fire into the air (the implication being that she will be able to shoot him without danger to herself) because he has fallen in love with her. He is about to leave, without getting his loan repaid, but she embraces him and confesses her love to him—and Luka is mystified by the day’s events. Two elements more than any others are essential for a successful performance of The Bear: Strong singing actors with the ability to play these character with broad, humorous strokes, yet without going so far as to become ludicrous; and a well-honed orchestra that matches the singers in timing and wit. Both elements were filled brilliantly on Friday. Indeed, I find it hard to imagine how this production of The Bear and these performances could possibly be bettered. 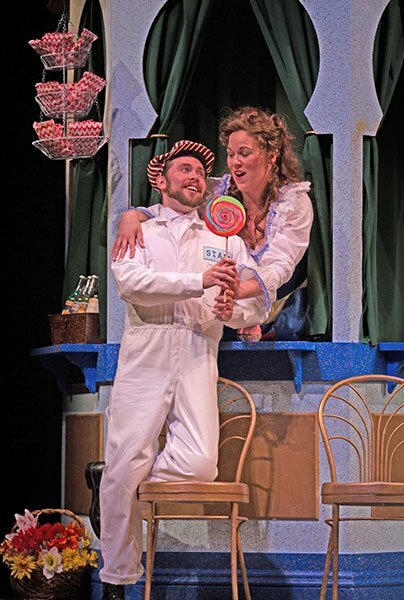 Mezzo Janna Baty as Popova and baritone Stephen Salters as Smirnov are both well-known to local operagoers for their rich, superbly trained voices, their musicianship, and their acting ability. Just to name one earlier occasion in which they were featured here, Baty played the role of the Duchess in the 2003 production of Powder Her Face, which will be mounted here again in June (with different singers); and in alternation with that Salters played the title role in Elena Ruehr’s Toussaint Before the Spirits. Both performances placed them at the peak of singing actors currently active in opera. This is by no means to omit the smaller part of the long-suffering servant Luka, whose head is graced with a hairdo not dissimilar to that of the pointy-haired boss in the comic strip Dilbert, crossed with that of Groucho Marx from his early movie days. Simon Dyer sings superbly and is amusingly desperate in trying, first, to encourage Popova to accept life again, and later simply to understand what is going on. Baty and Salters both fully inhabit their roles in a way that fills the theater and positively forces the listener to attend to everything they say and do. Their diction is extraordinarily clear, making supertitles otiose, and keeping the developing story clear and very funny. In addition to this, their musicianship keeps them attuned to the pinpoint parodic touches in the orchestra, many of which are very precisely timed. The orchestra—directed with humor and elan by Gil Rose—and the singers create moments of laughter precisely because the timing is so exact. One of the most delightful examples is the moment when the two are discussing the duel, before Popova goes to get her late husband’s pistols. Each one makes a “pistol” with their hand, and pretend to shoot the other—“pop, pop!”—which is matched in the percussion by a sound like a popping cork. The precision of the timing, even as the rhythm of the “shooting” changes, is wonderfully witty. In films this technique is sometimes referred to as “Mickey Mousing” from the way the soundtrack exactly corresponds to images in animated film. It may often be a cheap trick in films, where the coordination can be handled mechanically, but in a comic situation on the live stage, it makes one react with delight at this excellent timing. Walton knows his operatic literature, and he sometimes recalls other operas with specific musical references, or at least types of approaches from the history of opera, which adds further delight to the listener. The very opening of the opera consists of string glissandos before a closed curtain. Once the curtain rises, we know that they are expressing the over-the-top tears of Mme. Popova in her widow’s weeds. But at first—recalling that The Bear was premiered in Britten’s theater at Aldeburgh in 1967—that the sound could be a sly reference to the unusual opening of Britten’s own Midsummer Night’s Dream, premiered in 1960. When Smirnov urges Popova to “unveil as did Salome” (singing the words here as he unwinds a long shawl that had been wrapped around her body over the black dress), the orchestra slips in a brief moment of the music that Richard Strauss wrote for Salome as she was beginning her notorious dance. From beginning to end The Bear is filled with musical jokes and playful touches in the acting. Director Lynn Torgove commented modestly (in a pre-performance video) that when a director is blessed with two such gifted performers, all one has to do is let them do their thing. But clearly she has pointed the wit and satire to a peak of hilarity. Once again Gil Rose’s direction of the orchestra—modest in size but with parts making many intricate demands, especially in timing with the stage—and the singers has produced one of the most thoroughly satisfying hours at the opera that I have ever experienced. And judging from the outburst of cheers that followed the curtain, this was a general reaction inside the BU Theater. This is not a Siskel and Ebert act, but since Steven Ledbetter and I were both at the performance last night, I can’t resist putting in my oar. While I generally concur with his evaluation of the Odyssey double bill, especially his praise for the singing (to which I would add special mention of the superb elocution), musical performances, costuming and set designs, I do have some reservations about the interpretive approach adopted by the staging. It’s an article of theatrical wisdom that the broader the farce, the less exaggerated should be the performance. A good script doesn’t require elaborate mugging to evoke laughter, and one definitely doesn’t see such staging in professional performances of the G&S canon (or in other comic-opera classics like Die Fledermaus). Both of the works presented suffered from over-zealous sitcom stagecraft. I think Lynn Torgove should have dialed back, rather than egged on, the performers’ tendency to overblown gestures and facial contortions. The Zoo was, of course, meant to be silly, but even without the razor wit of Gilbert, it was silly enough on its own; and I don’t think The Bear was meant to be silly at all, just funny, in a more sophisticated, dare I say Chekhovian, way, so for different reasons it didn’t need a laugh track. Since I am conducting The Zoo at the end of next month in Northampton, I am particularly interested in Steven Ledbetter’s comments. (Of course, I am always interested in Steven’s comments.) However, I think he errs in attributing Carboy’s attempted suicide to unrequited love. The reason is sillier than that ( a case of mixed pharmaceutical prescriptions). More important, though, is the tendency to berate Stephenson’s book for lack of wit. It seems to me that the difference between the banalities of the libretto and the charm and aspirations of the music is the point of this piece. How else to explain “is it your wife?” and “What a very nice young woman” at the end of two scenes – and the examples could be multiplied. Gradually it might occur to the audience that “zoo” is not a description of the location of the show, but a metaphor for the characters whom the audience is watching – silly, stereotypical, frantic about indigestion, the solid (but much abused and feared) British public. Not a masterpiece, when compared to Trial By Jury, but a delightful and original show in its own right. My description of Carboy’s reason for attempted suicide was based on the first stanza of the song I quoted, but I simplified it in the review because it was already quite long. The pharmaceutical mixup was amusing, and doubly so when Letitia arrives to explain that it had never even happened, but was a joke perpetrated by her sister. Certainly lines like “Is it your wife?”–totally unmotivated in the text before that moment–suggest a parody of Victorian melodrama, which seems the point at some other moments in the show as well. Best wishes for your production! It is difference of opinion that makes horseraces. I concur in general with Vance Koven points about broad comedy. In Gilbert & Sullivan, if the characters KNOW they are being funny, and transmit that knowledge to the audience, the humor collapses. Nanki-Poo and Pooh Bah, for example, must carry out their dialogue in which the latter explains how difficult it is to adjust all his official positions without a very large “insult” (meaning bribe) with absolutely straight faces. I personally did not find the actions of the characters in “The Zoo” to be an example of trying (in that sense) to be funny; they were extreme, but utterly convinced of the manner of their actions. And even more, to my mind, were the principals in “The Bear” acting entirelyaccorancd with their clearly established personalities and characters, never condescending to facial expressions or gestures that were not fully motivated by the words and situations of the Chekhov-derived text, which–to me, at least–made them utterly delicious. I agree with Steven. It seems to me that Lynn Torgove (in The Bear) took her cues from Walton’s rich, witty and sometimes slapstick score; the staging seemed appropriately ‘Waltonian’. What particularly impressed me was the seamless transition from broad comedy to a place of genuine emotional feeling. There was laughter and tears – what could be better? Bravo to Baty, Salters, Dyer, Torgove and Rose!